Sunday, like Saturday, started with rain. When I arrived at Bird Island near noon, black clouds hung on the horizon. Distant thunder rumbled ominously. But where I stood the sun peeked through the clouds and the winds hovered around 10 MPH. I rented a board, the F2 Stoke 155 again. This time I got a 6 meter sail. I spent a couple of hours practicing tacks, beach starts, and trying to sail fast. I'm starting to feel good about my fast tacks. Turning the board the final distance through the wind still trips me up occasionally, but not often. I found that it helps to tilt the sail out before moving it forward again. This speeds the rotation of the nose through the wind. Putting the mass of the rig over the water gives something to pull the nose against. While practicing lots of quick tacks in shallow water I ran into Olivier teaching a class. He complimented my improving sailing ability (go me!) and said I should start using the harness. He suggested that I spend some time practicing hooking in and out. Up to this point I admit I have been a bit afraid of the harness. I had taken a harness class, but I was still a bit worried about getting carried away to Mexico or catapulted. Actually, I'm still not sure exactly what a catapult entails. The texts seem fuzzy on the definition. I imagine medieval siege engines, boulders sailing over walls. But perhaps it just means getting pulled down with the sail -- not so bad. Anyhow, at this point I was feeling better about performing tacks and more in control of the board. Even if the harness pulled me to the straights of Florida, I'd be able to turn the board around and get back. I rented a harness and followed Olivier's advice. I hooked in and out of the harness repeatedly. Gradually I became used to the process and my fears subsided. I ended up hooking in for longer runs and catching some gusts. A several times I even got up on plane for a moment. Much to my amazement, I only got pulled down by the harness a two or three times. It didn't hurt, although one time it did take four tries to unhook the harness from the fallen rig. Each time I pulled the harness line out of the hook, it sprang right back in before I could roll off the sail. I learned a few things about harness sailing. First, dumping the wind means twisting the sail. You can't just let go with your back hand while wearing a harness. That path leads to imbalance. No, instead it seems to work better to rotate the sail so the mast turns windward. Pull with the front hand, push with the back. This quickly reduces the force on the sail. Of course, you'll never go fast dodging every gust. Second, with good wind you can put a lot of weight in the harness. I found it a bit difficult at first to rely on the harness to hold the force of the sail. I had to fight the urge to wrestle the boom with my arms. Despite my reluctance, putting weight on the harness seems fine. If the wind dies, recovering a stable standing position requires only a quick yank on the boom. Still, I have many areas for improvement. I had a difficult time keeping the board pointed windward while hooked in. A beam reach seemed like the easiest position to sail while harnessed. I think this may have something to do with my positioning on the board, but I'm not sure. I also still need some guidance on getting and staying on plane. Planing really excites the heck out of me, but my limited steering control makes it feel like riding an acme rocket. Perhaps practice will reveal a solution. I headed in around 5:30 as Worldwinds threw a little party. Don cooked up some excellent sausage wraps and other yummy food. Having spent most of the day sailing, the food hit the spot. I chatted with some of the other sailors and ate like a pig. I returned to the hotel, desalinated, and watched another big thunder storm move through the city. I retired with blistery hands, sunburned shoulders, and a smile. Saturday didn't start off looking very promising. The weather report predicted rain, the sky hung dark, and the wind barely hit 5mph. There was a handful of folks sitting around Worldwinds reading, waiting for wind. Through some miracle, the breeze hit the double digits around 2:30. I rented an F2 Stoke 155 with a 6 meter sail. By 4 the sun made its appearance and it looked like paradise. Suddenly there was a crowd on the water. After an hour of sailing I decided to come in and get more sunscreen. When I came back to the beach I couldn't figure out which board was mine. I knew that I had a f2 stoke 155, but the sail on it seemed wrong. Nearby there was sail that looked like mine, but the board was a JP X-cite Ride 160 -- also wrong. I bent down to take a closer look at the sail on the Stoke and was convinced I had walked into another dimension. In addition to the color, the harness lines definitely didn't match what I had just sailed, and the sail seemed huge. Do I fly around on giant sails in this alternate universe? I touched the sail and nearly jumped out of my skin when Don shouted from the deck "That's not your board... Not unless you want a 9 meter sail." I contemplated this and decided I definitely didn't want to sail the monster. I learned that one of Don's customers was performing research on the x-cite and the stoke. I talked to him as we walked to deeper water. The gent was planning on buying one of them to take back to Phoenix. Our boards were swapped so he could compare. Mystery solved. Later my path crossed again with Mr. Phoenix on the water. We stopped to compare notes on the Stoke 155 and the x-cite ride 160. We both agreed first and foremost that the JP had a sinky nose. When performing tacks, the front tends to swamp and the chop washes over it. The stoke felt like the front had a lot more float. In addition, the F2 felt more stable at low speeds. The board seemed to forgive small mistakes that would sink a rail of the JP. However, the JP did seem to plane faster than the F2. Since I'm just starting to get the feel for planing, I'm not certain if the board or the rider should be blamed for this. Mr. Phoenix thought that the x-cite might possess more room for growth than the Stoke. A little instability leads to fun tricks perhaps? Mr. Phoenix also noted that the fin on the Stoke seemed to break free easier than the JP. He seemed to think this was correctable. I can't say that I have the skills to have an opinion. I'm finally starting to get the hang of fast tacks. Or, at least, I'm falling off a lot less, even when I sink the nose. I don't think I've quite put the fast in the tack, but I'm faster and I no longer tip-toe around the mast as much. Now I stomp around with big steps that miraculously don't throw me off the board. Steering feels more natural too. Beach starts feel easier, even in deeper water. I'm successful around 75% of the time. Unless my cheapo aqua socks get pulled off by the muddy bottom. I occasionally found myself planing. I'm still not sure how to control or maintain it, so it doesn't last long. Sure is fun though. If the weather cooperates perhaps I'll get help in my Sunday class. The Corpus trip is about three days away. Prepare yourself with some online training from US Windsurfing. Link. 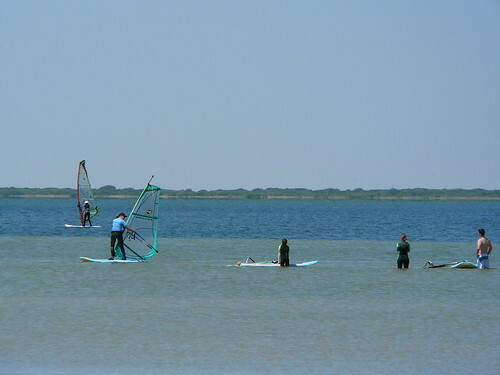 The Austin Windsurf Club is holding beginner windsurfing classes on the 19th and 20th of May. Classes seem to be almost full, so sign up soon. This qualifies as the best rig-mounted camera work I've seen so far. Nothing too fancy here, but you can get a pretty good look at how ebrandhorst sails. You can see examples of a waterstart, hooking in, getting into the straps and jibing. Though relaxing, the flick has me itching to get back on the water. I hope to see you in Corpus soon. My parents told me that baby surfboards are brought by storks. Instead, the process seems to involve a spray of styrofoam, plastic bits, the application of form-fitting vinyl, and lots of resin rub-downs. Oh, and don't forget the bad elevator music. 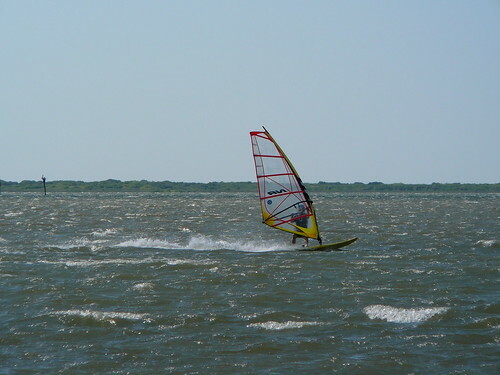 We'll be windsurfing in Corpus Christi in two weeks. Are you coming on the trip? Please let me know. 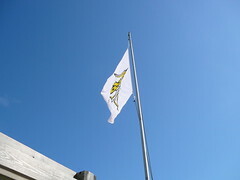 The long-term forecast for Corpus is looking good: "Windy in the afternoon". Sounds ideal, doesn't it? Keep your eye on the boom. JP Australia's site features several hypnotic windsurfing videos. The highlight videos function mostly as ads, but they are educational because they illustrate the various branches of windsurfing. The other films skip the sell, so be sure to check them out. I suggest peeking at the air-tastic Maui-07 video first. Cabo Verde also gets a nod for the unusual music and dream-like quality. Groovy. Does anyone know how surfers retrieve their boards when they fly away? Could they possibly slog through those waves and find them again? The surf looks a lot more intimidating when the guy transforms from a graceful rider to a tiny swimmer. Maybe one of the benefits of having a sponsor is that they just give you a new board when the old one blows to Nepal. Must be nice to have a sponsor (or live in Nepal). The Ten Step Guide seems a little dated in areas, but it does have a good review (with diagrams) of beginner to intermediate windsurfing skills. The guide also covers some safety points and rules of seamanship. Reviewing this before your next trip to the beach couldn't hurt. Link. The time has come. 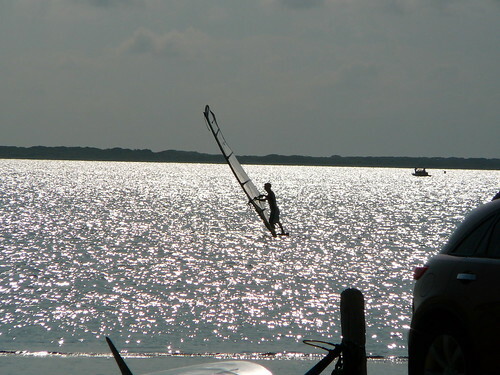 Another windsurfing adventure has been scheduled for May 26-28. My apologies that this overlaps with some people's schedules. Unfortunately my first choice of weekends got booked up before I had a chance to send out an invite. Don't fret: I'd like to have a June trip as well. This will be trip #5. 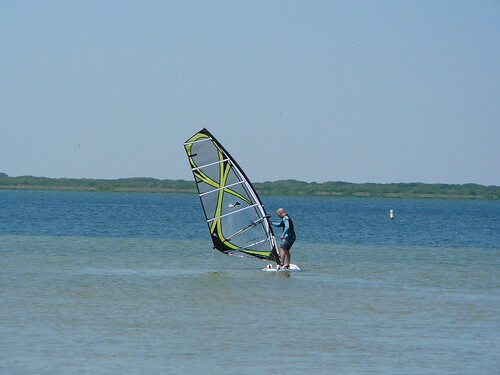 A trip to Corpus means windsurfing classes during the day. At night, we'll be eating wonderful seafood and drinking a good beer or two. Except for the windsurfing, everything is within walking distance of the hotel downtown. You can see the photos and posts from the last trip here, here, here, here. If you have any questions, you can leave a comment, call me, or shoot an e-mail to john at windaddict dot com. For lodging, I'm staying at the Best Western (Best Western Marina Grand Hotel). 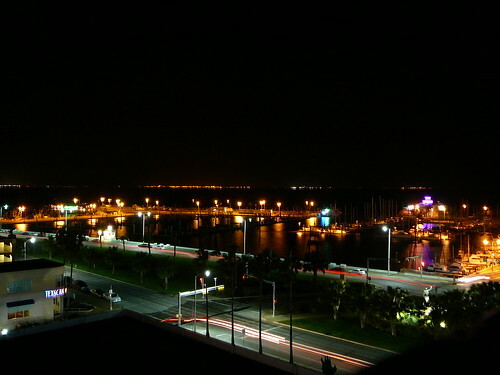 This 2-star hotel is downtown, right next to a marina on the bay. You can find more info on it elsewhere on the blog. Check-in time is 3pm, checkout time is noon. Make reservations at the Best Western Marina Grand hotel or arrange to share a room with someone who did. Check in on 26 May, checkout 28 May. When I checked, the internet rate was the best deal. You are responsible for your own hotel reservation. Call Worldwinds at 1-800-793-7471 and schedule your classes, or reserve a board rental if you don't want to take a class. Tell them that you're with John Knox's group. Arrange to carpool and share your room. Feel free to post comments asking for rides or riders. You can find more information on Worldwinds, what to pack, and more in other posts. You'll want to take the beginner class on Saturday. You can ask Jay, Jason, Matt, Karen, Freddy, or anyone else -- it isn't hard, and it's lots of fun. The beginners class will probably start at 11:30 am. On Sunday, you might want to try the intermediate class. I suggest at least giving it a shot, but it's up to you. The difficulty level increases a little, but it just means falling off the board a bit more often. Falling is half the fun. I strongly suggest taking a class on Saturday even if it is just to get a refresher. With a month between each surfing session, a refresher can mean the difference between struggling all weekend and moving on to the next level. Don't forget to reserve a rental board for the days you don't want to schedule a class. The drive from my place down to Corpus takes about 4 hours. If you live north, it will take longer. Lets leave Austin at 6:30am. This will give us some time to get there without rushing, and maybe pick up lunch along the way. We should be surfing at Worldwinds by 11. Worldwinds closes at 6pm, so we should all be checked in at the hotel by 7pm. We'll desalinate and aim to grab dinner downtown at around 8pm. I'm thinking that I'd like to try the Waterstreet Oyster Bar. Sunday, maybe we can get brunch at the Water Street Seafood Co. or La Bahia. After, Windsurfing class or practice for as long as we can take it. We'll play it by ear for dinner. Lets do breakfast at Agua Java. Afterwards, of course, more surfing. Around 2 or 3 pm, I'll probably drive back to Austin. The Peconic Puffin blog has posted two interesting videos recently. The first features a couple of kids showing off their crazy freestyle skillz at night. They look like they're having a blast. I'm jealous. The second has a video summary of attempts at breaking the 50 knot sailing speed barrier. The current world record is held by Finian Maynard, at 48.7 knots, or 56 mph. You'll see him in the video: he is the giant riding a toothpick. Can't miss him. The Corpus Christi Velocity Games, AKA The US Wind & Water Open takes place May 11 -13 2007. The event features windsurfing, kiteboarding, and skateboarding competitions. If anyone is interested in carpooling for a day trip (or longer) to watch the games, let me know! Originally uploaded by Ciccio Pizzettaro. No, not the Bogart film. The sailing yacht. 289 feet of shiny black hull. 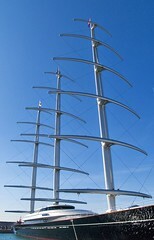 3 rotating masts. 15 square sails. Check out the Wikipedia entry. And visit the official Maltese Falcon website. Be sure to look at the photos and the log once there. I wonder if the owner ever needs someone to boat-sit. I'd be happy to help out. I don't think I'd mind living on a yacht like this. This video isn't really exciting, but it does show that hydrofoils can work in windsurfing. I've been wondering about that for a while. It also shows that adding a hydrofoil is a bit pointless. The board doesn't seem to be going any faster with the foil (watch for the traditional board in the background). I expect this is because the foil requires a lot of drag to create the necessary lift. The foil does make the ride smoother, but that seems boring. Maybe the foil would come in handy in wave sailing? WindGuru provides a detailed weather forecast several days in advanced. Each day breaks down into three hour intervals with information on wind speed, direction, cloud cover, precipitation, temperature, and more. The biggest limitation I find is the number of available locations. Corpus Christi has forecast data, but Austin does not. I'll live. If you have a mac, there is a WindGuru dashboard widget available. The widget provides data for a 24 hour window. It also has a nice animated windmill which really spices up the dashboard. I'm probably cheating by posting videos three days in a row. You'll survive though. Watch for the guys who confuse their rig for a hang glider.